Animals awake beneath blue blankets Clickety-clack! The cows on Farmer Brown's farm are typing again. Duck can't wait to show everyone their latest note. Just what are they up to this time? Duck's not telling, but if you follow the alphabet one letter at a time, you'll find out. And you'll have as much fun as the animals are going to have, and learn your letters, too! 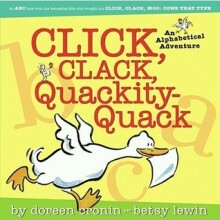 This alphabetical adventure for the very youngest fans of Duck brings alphabet books to a whole new level -- click, clack, quackity-quack!